Finally able to get back to some small dailies. This is a variant on my post of March 7th. My purchase button is not working at the moment, so please Email me if you're interested in purchasing. 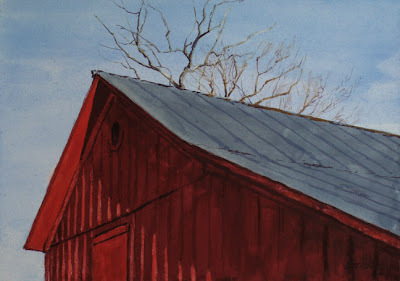 what a beautiful spring barn painting..that tree is just waiting to burst, I can tell!! Thank you for your kind comments on my blog...your opinion is important to me! Hi Holly, thanks a lot and glad you came by. Don, I love this one. Nice division of space and that is a great red. The simplicity of the scene speaks volumes!